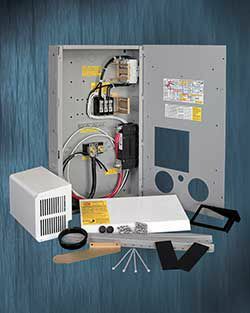 The Midnite Solar MNE175STM240-L is an easy-to-install disconnect box that has 175 amps and either 120 or 240 VDC. It's available in either a gray or a white steel chassis with a left-hinged door (also available with a right-hinged door MNE175STM/240-R). 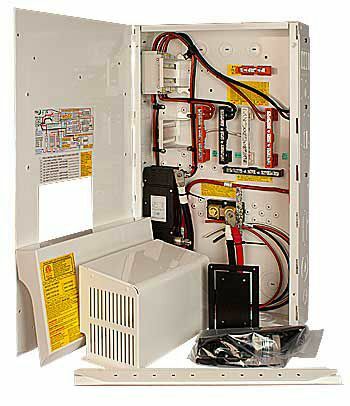 The Midnite Solar E-Panel fills a void in the AC/DC Disconnect marketplace. A compact, affordable panel which can mount a single inverter or be stacked horizontally or vertically to hold multiple inverters. Unlike other Power Systems that tend to take up a large amount of horizontal space, by using a vertically stacked pair of E-Panels you can have two inverters in about the same space as a broom closet. Pre-wired to save time, money and complexity.